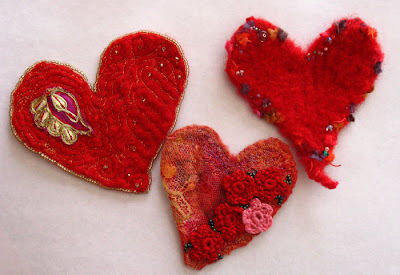 The hearts were knit with wool using a pattern from Nicky Epstein's book "Knitted Embellishments", then felted. The one on the left I actually didn't change much - there is lots of top-stitching done in YLI's Kaleidoscope gold thread & an embellishment from India - I once bought a ton of these for my dragons and still have lots to work with. The one in the center bottom had the most dramatic change - I had stamped a face onto the left side, an eye was embroidered and there was a cluster of beads on the right. I had fun learning how to crochet the flowers and beading around them. 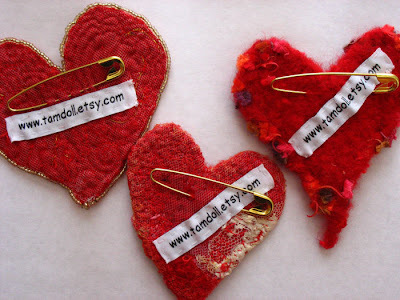 The one on the right - I just added some beads around where the yarn embellishment was, it came out very pretty. Visit flickr to see more. Noro! I want some Noro too! I do believe these are confections of the HEART. Those hearts are so cute. I'm just starting to do some felted crafts. I'm having a lot of fun! I posted my first blog challenge if you want to come participate. Thanks for stopping by my blog! Thanks for stopping by my blog. I've changed the first blog challenge to a potluck dish. I think I stumped a lot of people with my signature dish idea! LOL! It's supposed to be a fun, easy challenge! LOL! Thanks for the book recommendation. I'll definitely add it to our reading list!